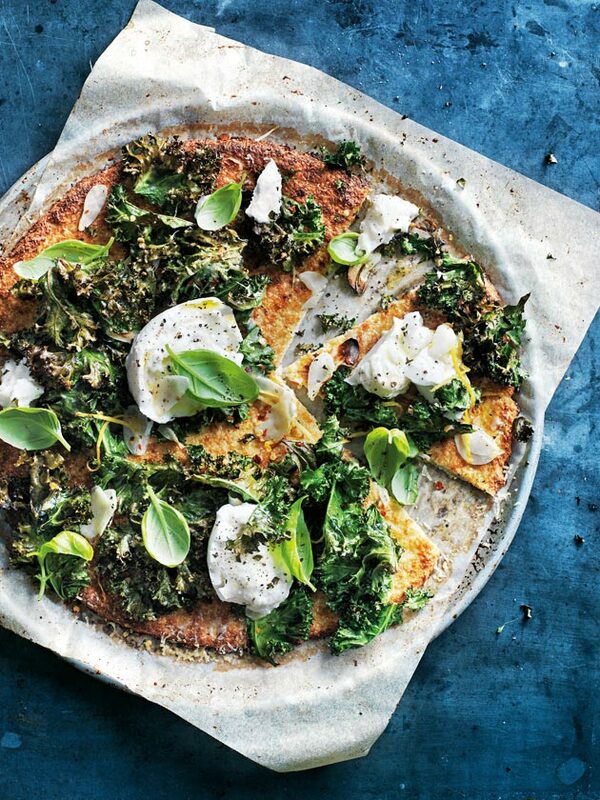 To make the cauliflower pizza bases, lightly grease 2 x 30cm round pizza trays and line with non-stick baking paper. Place the cauliflower, in batches, in a food processor and process until the mixture resembles fine crumbs. Transfer to a large bowl, add the almond meal, parmesan, egg, salt and pepper and mix until a soft dough forms. Divide the mixture in half and press into the prepared trays. Bake for 20–25 minutes or until golden and crisp. Place the kale, oil, garlic, chilli and lemon zest in a bowl and toss to coat. Divide the mixture between the bases and top with the parmesan. Bake for 8–10 minutes or until the kale is crisp. Top each pizza with mozzarella and basil to serve. Serves 4.